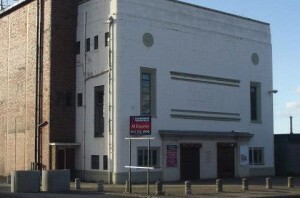 The Cinema is an iconic building dating from 1937, that fronts Bridge Road, a main thoroughfare in Wellington and the peeling paint and car park blockade doesn’t sit right with many townspeople who have to drive or walk past. The visit to The Clifton was, for many, their first cinematic experience, and some of those self same people will tell you the last film that they saw there too. The projector light dimmed for the last time in 1983, or did it? Since Dunelm left, a group of locals are looking at this as an opportunity to try and reclaim a bit of heritage back for the town. A recent ideas farm facilitated by Rob Francis of H2A brought together a number of interested and interesting parties to the table to try and find a way to secure the building for community use. I was delighted to learn at this event, that it was a tweet from @telfordlive that kickstarted the Save the Clifton Facebook page (go and ‘like’ it! ), and so I was happy to assist with a subsequent request from the creator Jon King, for a bit of help to keep the momentum going. Can you help with your expertise in Saving the Clifton? Would you like to be kept informed of progress? You would? Excellent. Just fill the form in below. No spam, honest. It’s not how we do things round here. What do you belong to? What PROFESSIONAL skills can you bring to the project? How much time are you able to give?